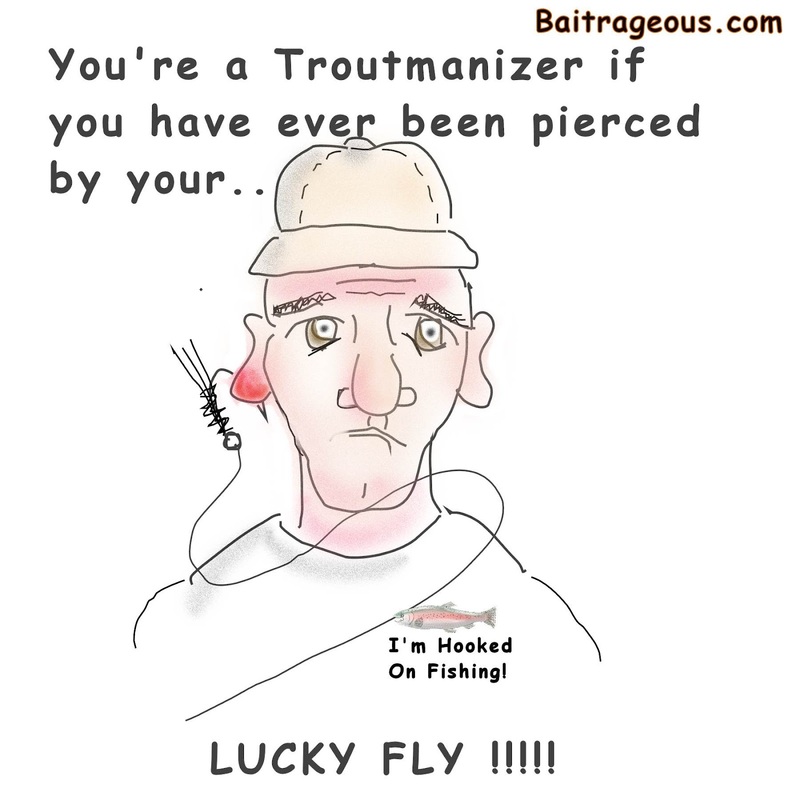 BaitRageous: Troutmanizer Number 3, Pierced by your lucky fly! This has actually happened to me, not in the ear but in the hand. I could't get the sucker out and ended up going to the emergency clinic in Paris...............That'd be Paris Tennessee. This is a story for another time. Ouch, but that counts Ashley! Heck, it was a spinner bait that attached its self to my hand. Not in the ear, I've learned to duck. Last year I got a hook stuck in my little finger and the other hook was still in the fish. Don't think that wasn't fun. On top of that, I didn't have a pair of pliers with me. By the time I got the fish off, the hook was all the way in past the barb. OK Larry, this is where it gets gross. Grabbed the hook with a pair of pliers and pulled it out. A little first aid cream, a Bandaid and back to fishing for the rest of the day. Yep, I tried but the sucker was too deep. I added the story in a post you can read. 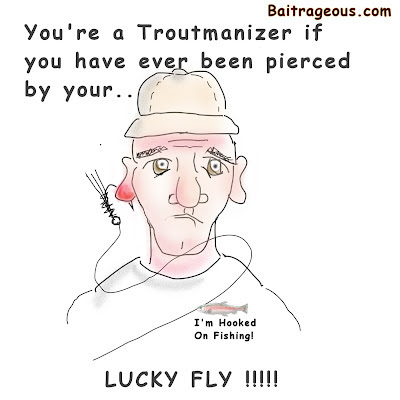 No kiddin', Larry, I used to fish years ago with an ol' retired military feller from Tennessee of all places. Yes, he did so adeptly hook a nice looking streamer in one of his ear lobes. Had to go to military hospital to get it removed. I cannot print here some of the southern social skills he shared with the nurses that day! As we say in the South, Ah Heck Mel really! On my visit to the hospital I learned how to properly remove a hook. I posted the story for you to read.